In late 2005 we were just about to purchase the empty lot next to our little 1950 ranch style home in the Santa Monica Mountains. We had been patiently waiting for the opportunity since first purchasing our home in May 2000. To our horror the neighbor turned around and sold the tiny, substandard lot to a developer. Our intention with the lot was to preserve the four gigantic oak trees and create an indigenous garden. The intention of the developer was to take out all the trees and construct a 3500 square foot palace. We had always been told that oak trees were protected. Indeed, Los Angeles has something called "The Protected Tree Ordinance", however, the ordinance means basically nothing when it comes to a developer wanting to build. In the same parallel universe, the blending group I belong to was to make a perfume with the idea of Beltane. Beltane, like the upcoming Samhain, is one of the eight Celtic holidays. An ancient Druid holy day occurring on May 1st. Thus, on Beltane eve, I went out and gathered leaves from a large coastal live oak with the intention that the four trees would stay firmly rooted and thrive. I carefully cleaned the leaves and tinctured them as the base for my Beltane perfume contribution. While the tincture marinated I created a wood chord of sixteen different essential oils, absolutes and C02 extractions from the wood family. After filtering the tinctured leaves I began building the perfume, first with the wood chord and then adding other notes until the fragrance was complete. 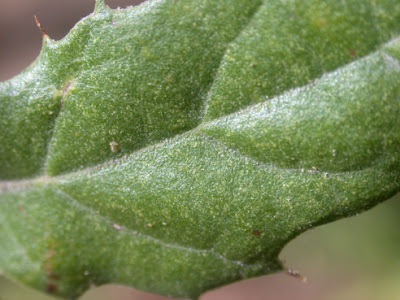 Pondering what to call the perfume I settled on Quercus, which is the botanical name for Oak. The reviewers in my group raved about the fragrance. One of them mentioned the following to me privately: "I cannot stop sniffing your newest which you call quercus. It is the same name as a Penhaligon cologne (not nearly as beautiful as yours) but I thought you should be familiar with it." At the time I thought, okay...well...we will see what transpires with this Quercus of mine. Today, a friend sent me a note with a little soap enclosed. 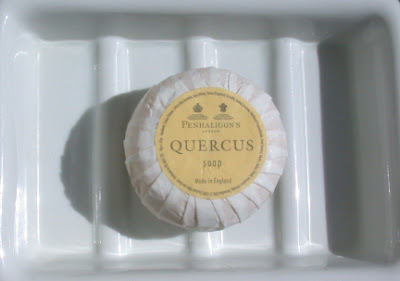 I gasped when I opened it, on the white paper of the little round, carefully wrapped soap was the word QUERCUS. So, is this a challenge or not? They certainly share nothing similar in the fragrance department, although the Penhaligon description works for our Quercus: Citrus, Amber and Wood. How interesting and so synchronistic. From what I can see on their website the Penhaligon cologne does not appear to have a direct link to Oaks, rather, perhaps they liked the name? After all, Oaks are strongly connected to the Druids. Many of their perfumes are named after botanical nomenclature. My understanding is that one cannot copyright a word like Quercus. I bow to the mighty oak and all they continue to teach me. A portion of the proceeds from the purchase a 1/4 oz bottle of our Quercus perfume goes to the California Oak Foundation.